'Time Jazz confronts us all,' apparently. You gotta love the Biff. Four new tracks then although 'That Golden Rule' has been available to listen to for about a month. It's a great song though. Overblown dynamic rock spelt RAWK with hands held aloft making the devil sign. I imagine. Classic Biffy in some ways but it could easily of sat on last album 'Puzzle'. 'Prey Hey' has a chorus to die for and a throbbing bass riff that doesn't relent. 'Eyelids' is a bit throw away, likeable enough but not as challenging or inventive as we've been used to. 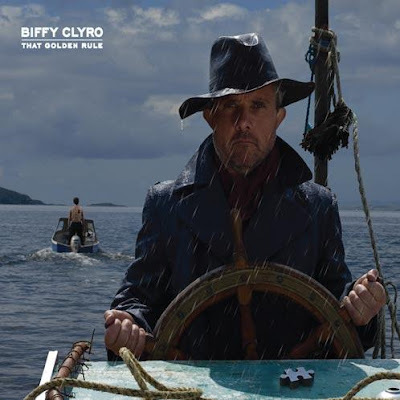 Then the last minute or so descend into a refrain that is classic, Biffy and the song pulls itself out of the mediocre. 'Time Jazz' is the sort of song that no-one but Biffy make. Slower than the other three here and with maybe a hint of Marmaduke Duke bleeding into it. We're not talking 'Machines' here, it's slow and pretty, but uplifting. Simon still manages to shoot it through with some great obscure lyrics. What is clear is that Biffy Clyro's great run of form looks set to continue for a while and November's Gig looks more and more like a big deal. Biffy will not be playing small venues like The Guildhall forever.